One of the great things about sewing is finding fabric. Don’t you think so too? Its fun to get together with other sewing friends and blab on and on about this fabric and that fabric in our stash and what brought us to purchase it or how it came to be in our possession. Its really great until you start, finally, noticing that the fabrics that you love so much, you never use and never wear because you are afraid you’ll ruin them. 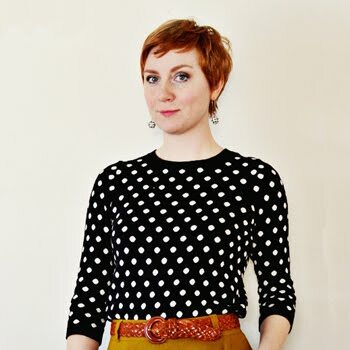 Last year, I attended a sewing conference where one of the guest speakers waxed poetic about her love of vintage fabric and patterns. She was funny and captivating to listen to and she said something that’s really stuck with me ever since. She talked about how she had acquired some amazing vintage rayons – like authentic 40s rayons – that she knew she would never use because she was too afraid she would ruin them. Its funny to joke about, but I think many of us that sew often end up thinking and doing the same thing as the cute girl I described above. I know I do! My personal fabric stash is truly something to behold. Ultimately though, unless you just decide that you are going to use the fabric in your stash, it will end up becoming the stuff of legend where you’ll talk until you’re blue in the face about how much you love this or that fabric…..that you’ve never been able to wear but you think is the most beautiful thing you’ve ever owned. Kind of ironic, isn’t it? Today I wanted to share some tips with you about how to avoid becoming a fabric hoarder and how to become a fabric user. So let’s get started! Tip #1 – Before you start, just know that you’ll ruin gobs of fabric anyway. I’ve ruined tons of fabric, but one of the key things about becoming a better sewer is learning how to fix what you think at the time is an unfixable mistake. Before you decide to trash a project, try getting another person’s take on the situation. If you’ve got a sewing friend, definitely invite them over for a cup of tea and a little brainstorming. Or take your project to a local sewing shop and ask if you can just get a second opinion about what to do. You might be very surprised at what other sewers’ come up with – many have experienced the same thing and found a creative way to fix their problem. Instead of letting the idea that you’ll ruin fabric get in the way, just know that most problems are actually, quite fixable. So, go ahead and cut out your favorite blouse pattern in your favorite fabric. You’re one step closer to wearing your favorite fabric rather than just looking at it! Tip #2 – Use tried and true patterns! Instead of always reaching for a brand new sewing pattern to try out on your favorite piece of fabric, reach for a pattern you’ve made before. This will help to eliminate much of your anxiety in using some of your favorite fabric pieces and thinking that you’ll just end up ruining them. Plus you’ll have a better handle on fit and who doesn’t need that? Tip #3 – Impose a self fabric buying ban. Try to work your way through your stash (also known as stash busting! Yay!) and only purchase items that you need to complete a project ie: thread, notions, trim type fabrics or ribbons. Instead of acquiring more fabric, you’ll find that doing this can give you a very different perspective on purchasing new fabrics, which brings me to Tip #4….. Tip #4 – Purchase or acquire only those fabrics that you know you’ll use. It might be really hard to pass on that amazing crepe back satin you just saw, but really stop for a second and determine whether it’s a fabric that actually has a place in your life. I’m totally serious too! You might be surprised at how impractical some fabrics are if you really stop to think about it about. I for one have found that silk chiffon truly does not have a place in my wardrobe – its one of those fabrics that is completely impractical for me to have. I don’t have anywhere to wear it and I definitely don’t want to maintain it either. Its delicate nature doesn’t do well in my not so delicate life. Also, consider whether or not its fabric that would ultimately become to “sacred” to use. For instance a piece of Liberty of London Tana Lawn that is so beautiful you must have it, but yet, in your heart of hearts you know you’ll never use because it would become too precious to ruin ie, sew it! Don’t buy it if you feel that way. Work your way up to purchasing a fabric like that or purchase that kind of a fabric with a pattern you’ve already made in mind. On a final note, I’ve come to realize the importance of that old adage, “work with what you’ve got.” I work in a fabric shop and a customer came through and talked about how much her grandmother would have loved a shop like the one I work in. The grandmother’s true love was for purchasing fabric and many a time her granddaughters (like the one whose story I’m relating) would get into her fabric stash and find a true gem that they begged for a dress to be made out of. The grandmother would always say “no” and explain that she was saving that fabric for something else. Sadly, even as the granddaughters all grew up, the grandmother had never yet used much of the fabric that many of the granddaughters had wanted years before. Instead more purchasing and acquiring of fabric was had and when the grandmother passed on several years later, there was a huge fabric stash that was divided up among daughters and granddaughters. Acres and acres of fabric that the grandmother had been saving for “other projects” were never realized and instead of being able to enjoy the fabric on her body or even as something else, the fabric was left to become yet another stash piece for someone else. I don’t know about you, but personally I feel sad about the prospect of my fabric stash becoming another stash piece for someone else – I want to enjoy it myself! I purchased it and I want to enjoy it as something rather than a folded up piece of fabric. 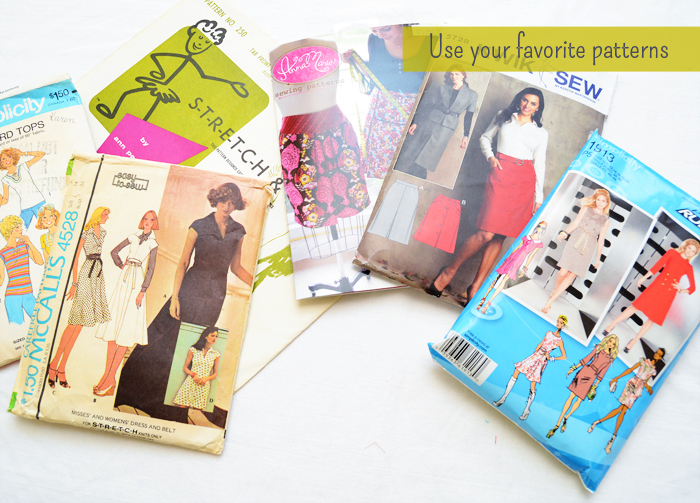 What do you think about fabric stashes? Do you have a giant stash that you need to work through? How would you feel about never being able to use your favorite fabric pieces and instead having them passed on to someone else? Wow this rings a bell for me. My mom just died and I got her fabrics(I'm the only child).I could see some of the things she saved to make something but never got around to to. Then there is my stash. No don't fall over it is a 16 foot long 4 ft deep closet full of material I've bought over the last 20 years. Some for me some for dd now 42 years old and some for dgd who is now 15. I've not made a thing in the last 14 years since dgd was born. Me and my mother were going to make stuff for her when she was small but sad to say we didn't. I must admit I've not bought any new material but have patterns. Hey they are on sale for 99 cents at Hobby Lobby right now. Can't beat that when some are 15 dollars now. Thanks for letting me know I'm not alone with this kind of hoarding. Now if I could just get busy and use all the craft stuff I've got so I can have my sewing room/craft room back. Beautifully said Sunni. I often put off making something for fear of messing up the fabric but you've allowed me to look at it from a different angle. In the past I've not shared fabric with my daughter, hoping I'd make that much dreamed of dress, shirt etc. However I'm learning that sharing, and watching someone you love, make something they love, brings SO much pleasure to you both. i don't have much of a fabric budget, so generally i buy fabrics only with a project in mind. sometmes i lament the fact that i can't buy more, but even when i have two or three unused fabrics waiting for me i start to feel underwater! This is something that I can absolutely relate to! I have a decent sized stash filled with some really special pieces that I purchased while traveling abroad (Italian silk jersey, Japanese silk, and some Liberty of London fabric). I have a hard time cutting into these, for the exact fear that you stated. I don't want to ruin it and I feel like I am saving it for something special. My day job is in the wine (and cheese) world and one of the biggest things I have told my customers for years is that if you purchase a really expensive bottle and never drink it, you might as well not have bought it! The same could be said for fabric. I guess I should listen to my own advice and get cutting!! Can absolutely relate! However, if you use up your stashed fabrics, you're just creating a space for some new stuff! This is really nice to hear, but I actually have the opposite problem, I am always ruining my fabric because I am not afraid of cutting it! I just can't imagine just keeping the fabric and not using it, I guess Carpe Diem is my motto when it comes to sewing, ha! When I was learning how to sew, the other students were really scared of cutting the fabric and starting their projects, but I just went for it! When I start a project , I am always thinking "It's just fabric! ", and when a project fails (which surprisingly, it's not very often), as you said, it was a learning experience, and most of the time I saved the fabric to something else,or completely changed the project,so the whole project wasn't wasted. I say, life is too short to hoard things, let's use them to make us happy! As a beginner (6 months in), I have developed a stash - ANYTHING sewing related is FUN!! I have nearly 200 patterns, probably 100 yards of fabric - already. I've gotten most during awesome sales at Fabric.com and FabricMart. And my beloved SR Harris fabric warehouse. So I don't have any truly "special" pieces. I love about 85% of it and the rest well...I rarely muslin but when I do, I have stash fabric. I am fasting but it is truly a joy to 'shop my stash'! I am working on little corduroy baby jackets and found perfect cotton in my stash to use as lining. Tote bags for the girls? Got it! Shorts for my daughter? Yep! I have fabric for that! I am always slightly baffled by the "too good to cut" mentality but then, I haven't dropped $$$ on a single piece of yardage. I do have a suggestion for those who MUST have this fabric but are scared to cut it: Buy a yard, and frame it. Yep, frame it. And use it as sewing room art. So far I haven't bought any truly expensive fabric, although I did have to take a deep breath before cutting the peacock feather print lawn from Liberty which my sister gave me for Christmas. But I agree that there is much more joy in using beautiful fabric, even if it gets ruined, than in having a cupboard full of stuff which will never be used. Having said that, I buy fabric much faster than I can use it, and may have to impose an embargo on myself until I've managed to clear some of it! The way I feel about stashing fabrics is the same way I feel about anything that people hoard and never use - antique furniture, vintage clothes, expensive shampoo, fancy dinnerware, whatever! What's the point of owning it if you're not going to use and enjoy it? My great-grandmother made me the most beautiful quilt, and I take it everywhereeee - it's on my bed, I drag it around the house, it's a picnic blanket, etc etc. It has a little wine spill and a tiny cigarette burn at this point, but so what? At least I've been enjoying it, instead of stuffing it in a closet and never looking at it for fear of "ruining" it. It's the same with fabric. The worst is when I see someone pull out a special yardage they've been saving, only to see it destroyed by moths or mold or fading or anything - from sitting too long. So sad! It's one thing to save a fabric for something special - and actively LOOK for that special until you find it - but just to tuck it away and never use it makes me so sad. These days, the only time I stash is if it's a superb deal I can't pass up, or something I won't find again. Otherwise, I buy as I need it. Gaaaahhh!! LOL! This is so true! I'm always a bit shaky when cutting into fabrics. No. Matter. What. The thought of 'what if I mess up??! ', always ringing in my ears, but in my short 6 months of sewing I've learned that there really are fixes for almost everything. I always hit obstacles when sewing and things never turn out perfectly, but I really do love being able to wear my not so perfect handsewn items rather than having a perfectly pretty fabric stash. I used to buy yarn and fiber like sheep, silkworms, and cotton were on the verge of extinction. Now that I have kids, my spending priorities have shifted... and I am enjoying finally getting to dive into the stash and spin yarn, knit sweaters, without spending a dime. HOWEVER, having moved twice in the past year, I was struck by how a large stash can weigh a soul down. I am not on a buying ban, per se, but I am on a stashing ban - not purchasing a damn thing until a) I know what I'm going to do with it and b) I'm ready to start the project THIS WEEK. That said, let me play devil's advocate. Think of ceramic figurines, paintings, holiday decor - the whole purpose is to just buy them and look at them. Why does fabric have to be used to fulfill a purpose? Can't we just enjoy looking at them and petting them, getting visual and tactile pleasure? Isn't that a noble purpose, too? Re wasting fabric: K King is quoted in a Threads article about how a new sewer has to be prepared to ruin a few acres of fabric in the process of becoming competent. I've held that notion close to my heart these past few years; when I have a wadder, I remind myself that it's not exclusively a waste of time/money, it's also the way I learned not to do XYZ. I have a suggestion that has helped me avoid acquiring far too much fabric; I now just acquire too much. And it helps me remember some wonderful fabric that I bought years ago. Get a plain notebook, perhaps the 9 x 12 spiral bound notebook size. Put this year's date at the top of the first page. Then start entering every new piece that you acquire. I give each piece a line (my handwriting is quite small). First the date purchased, then a description of the piece. Be specific. Write teal blue or sky blue, lawn or duck instead of just cotton. Don't use "multi" for that won't help remember which fabric this is: give two or three of the colors in our multi color fabric. Then the name of the garment that you plan to make. Again write "wrap dress with sleeves" or "short sleeved shirt." You can, of course, change your mind later, but have at least an idea, if not a specific pattern. I found long ago that any fabric that i bought because it was lovely but which I had no idea about its use never was sewn. I then give the name of the shop (abbreviate) and price. I tend to give the price for the fabric, then for the pattern (unless I have used the pattern already) then lining and notions, plus a total. Naturally I also date (in the left margin) the garment's completion date. Claire Shaeffer has a whole page for each piece of fabric (in her book on fabrics), suggesting that you add a great deal of detail about fitting and changes to the pattern; I think that this is good idea, but I have never kept quite this much of a record. I find that I never make more than a garment a week; most people sew much less. So I really should not buy more than an average of a piece a week. This sounds reasonable, but i have broken the rule enough that I have an enormous stash, which I am now trying to whittle down. I am also getting rid of some fabrics that I no longer like, but most of what I bought, even decades ago, still appeals to me. Don't buy something just because it is a great bargain or accept it as a gift. It is awfully easy to become a fabric collector and even to run out of all storage space for the stash. I suspect that most of the readers of this blog are much younger than I am. It is delightful that so many younger people are taking up the wonderful art and craft of making their own clothes. Perhaps this movement will assure that not all the fabric stores will go out of business, but in the mean time, many of us have little access to yard goods, so when we are in a wonderful fabric store we want to stock up. I do too. But consider your average output and don't buy three yeas' worth of fabric at once. I returned to sewing about two years ago after a long hiatus and, at the time, my stash was relatively small in comparison to some. Since then, I have purchased more fabric and, like some others, have developed a healthy stash primarily through sources like FabricMart (love that store). Anyway, I never purchase without at least having a project in mind though I do sometimes switch to something else along the way. That said, I don't think I have anything in my stash that I am afraid of cutting. In fact, because I mostly purchase at a good price, I feel free to go at it even if I mess up. I do, however, have some yarn though that I have been "saving;" and, now I think about it, I think I will go ahead and use it before I leave this side of the world. Thanks for your article! It sort of jelled a brief thought I had a few days ago. I'm pretty sure I read that the first time and reposting is a great reminder. We're starting to prep the house for moving and my sewing room is a big problem for having too much stuff. I went through much of my stash putting them in two groups 1. might sew now (have a project in mind) and 2. love it but I am not likely to sew that in the next 6 months even if I sewed every single day. Box 1 was a fair size but just one Ikea Expidit box and the clear plastic totes (yes, two) for #2 went to the garage. I've made two simple tops since I did that. It has me thinking that my stash is less inspiring and more overwhleming at the moment. I have a stash binder with swatches of my stash plus an excel spread sheet so I really know how much fabric I have in my stash! It's a nice reality check plus the satisfaction of having a fabric go to 0 yds and watching the graph of my stash get smaller and smaller motivates me to stash bust! Your opening paragraph is me spot on! I've been sewing for 17 years and collecting/amassing fabric through that whole time. I've used a lot of it, I make most of my own clothes and also do some historical stuff for fun, but I also get overwhelmed at times by the sheer volume of it. I refer to fabric buying as my substance abuse problem. I counted all my yardage a few years ago and it came to 1000m - a km of fabric!! I really hope it's less than that now. I've been on a fabric buying ban for several years now, but stuff keeps sneaking in somehow (how does that happen?). I do tend to only 'shop my stash' and almost never purchase for a specific project - I'd like to be able to get to the point of justifying doing that, lol. I've also been working on getting over the fear of cutting into the 'special' pieces and am making progress. I DO want to use and wear myself those fabrics I love most! Lately I've been doing periodic purges too and just this morning decided I need to do another one. I do want to get past needing purges though, it seems such a waste and I fear no one else will love the fabric like I do (that's one of my big weaknesses with buying as well!). Thanks so much for this post, letting me know I'm not totally alone and that there's hope for me yet! Great post! I like the advice to ask others what to do about sewing fails. I usually just bury them in the bin! I'm trying to work my way through my stash now, but I wish I could sew faster. Great advice!! I found myself cutting into some of my fabric I've hoarded for a couple years now and thought to myself, what am I going to do with these scraps? they are much too pretty to throw away. aaahhh!! How much is too much, I wonder? I'm not afraid of ruining fabric, but with my life, I just can't keep pace with my planned projects these days. I allow myself to stock up on basics when they are on sale at a great price (especially wool and knits). I also keep it all organized, with swatches in a little binder and everything stored in covered bins. Still, it's taking up a lot of room in my small apartment. Lately I have been trying to maintain a ban, with only partial success so far...! I guess there's always quilting. My mother was a dark haired, olive skinned woman of Hungarian-German ancestry. When she passed away, I was left wither stash. Some of the pieces had been sent literally decades before by my grandmother from Germany. So, you ask, what is the problem? I would love beautiful, european made wools and silks! Well, I am blonde and very fair like the German side of the family, the colors were awful on me! My sister who is dark, had no place for such high maintenance fabrics in her life. I wound up giving it all away. It was very, very sad for me. I have a very small fabric stash. Due to a small fabric budget and limited storage space in my apartment, I only buy fabric for a specific project that I'm about to work on. I'm actually a bit envious of other's fabric stashes. I do like the idea of writing down each fabric in a notebook. I agree wholeheartedly with the notion of not carrying a huge stash of fabric. I'm slowly working my way through mine and plan to have it all sewn by the end of the year. Rather than being a pleasure it became a burden...a weight of "should be" projects rather than what I actually wanted to sew at a given time. I'm excited to know that soon I will have sewn my lovely fabrics and will be "free" to buy something new and lovely for a project as it takes my fancy. I agree that the story of the grandmother's stash is sad in it's missed opportunities for joy. I finally realized - Just use it! There's always another amazing fabric around the corner. I used to hoard my stash, waiting to lose weight. I've lost 35 pounds and have started sewing, even though I have another 30 to lose. It's lovely to have some things I made, and I can always take the clothes in later if I need to. I inherited 1/3 of a stash from my favorite aunt, there was a huge amount and honestly I would like to get through most of mine so that doesn't happen with my stash. I appreciated your point on patterns, I think I start new patterns too often, I should focus more on shapes and styles that work for me and make tried and true outfits so that I don't have to spend so much time on fitting issues. Thanks for the post! I do remember when you wrote this post. Thank you for the good reminder. I have learned to share some of my stash with my daughter. I have been having fun watching the stuff that my little budding sewist has come up with! Lol. The story about the grandma not using her fabric to make her grandaughters stuff, makes me sad. What a missed opportunity for some wonderful memories. This was a really good post, I can completely empathise with fabric stashing. My problem isn't using the fabric, I'm all too happy to snip away, but I never know what to do with all the scraps. You know, the awkward pieces that aren't small enough to through away, but aren't big enough to do anything with. Thank you for the post. I may have more of a problem with purchasing patterns. But hopefully that will be fixed pretty soon because I am taking sewing classes and learning more about pattern making. I realize to a pattern maker that oodles of patterns don't make much sense. I just have a handle on fabrics. I have enough to get me excited and not too much to overwhelm me. I have 3 fabrics on hand and one is ready to cut out. I have wrecked something I thought I loved, loved, loved...and I am not nearly as upset as I thought I would be...I am still thinking about how I can fix it. But if not? Whatever! A friend of mine said to me once, and I can't believe I am quoting her, "If you love a fabric so much, but are afraid of wrecking it, take it to a dressmaker and get her to make something for you. Because it would be such a waste not to wear something you love so much." You have summarized so beautifully why I'm co-hosting the Stashbusting Sewalong this year. As creatives we're going to have stuff on hand but we need to be careful that doesn't get out of hand. Thank you for this excellent summation of the pros and cons of fabric stashes. Before I buy a piece of fabric (unless the bolt is almost empty and then all rules are forgotten), I try to sleep on it. If I'm still thinking/dreaming about it the next day, then I'm probably supposed to buy it! Not very scientific, but it works for me. I must say I do like to look at the fabrics in my stash. They are like dear friends whose company I enjoy! All the great blogs, tutorials, online classes and sewing expo classes have helped me improve my sewing techniques and gain enough confidence to start using a few treasures in my stash. The most expensive piece of fabric I have is a beautiful wool, cashmere blend, a plaid. Your recent postings on sewing with plaid have helped me get a handle on matching. As soon as I finish my current projects, I'm ready for the plaid jacket. You are so right Sunni. My biggest weakness are my travels...when I go abroad I normally end up buying fabric...and I have the excuse that I won't return to the same place so I have to! Recently I restrained myself and felt very proud. Once I got hooked on garment sewing I could imagine so many fabrics as fabulous garments and quickly built up quite a stash. Now if I see a fabric I really really love but know I won't sew up as a garment any time soon I will buy a tiny amount and make something else like a headband, zipper pouch, pin cushion, thread catcher etc.. These are quick makes and since they use so little fabric I don't feel bad about "ruining it". A lot of these little things in my favorite fabrics make me as happy or happier than a new garment would. I have a tiered stash system...I muslin at least once, and perhaps twice - using the "not so good fabric," to prepare to cut into the nicer fabrics. I have yet to cut into my Liberty of London Tana Lawn (one piece), but that's because I'll be making a muslin (from muslin) and then another from wearable fabric, that if it turns out - great - I'll wear it, and if it's a wadder, then back to muslining. Yeah, I definitely have a stash problem (started with quilting cottons years ago). Actually, my goal this year is to end the year with 1 fewer boxes of fabric than I started with. I've already done a lot of donating/giving away fabric, so really what I'm left with is stuff I'd want to sew up into various garments. When I'm in real stashbusting mode, I find it helps to allow myself one or two lengths of new fabrics, just to break things up (because you know, sometimes there's nothing like, "OOh! I like!" and then coming home and making something that immediately hits the spot). At this point, I make most patterns at least twice if not more, and try to stay within patterns that I know fit for every other garment - makes things go more quickly! I was the lucky inherit-ee of some stash and I avoided using it for the longest time. And then one day I realised that it was so much worse to keep it for nothing than to use it for something, even if that something turned out to be a learning piece. And so far? No wadders! There is some great advice here, thanks for re-posting this. I'm working through my own stash of fabric. Well, trying to. So far this year I've stash-busted 65 metres of fabric but then I've also fallen off the wagon and added 37 metres. Baby steps. I have a large stash, some of it was bought when my life was different to now (working full time, no kids), for a while I thought much of it would never get used. Now I'm hoping to use it for things I never thought of as I've started historical sewing which calls for my silks and wools. I also have a lot of man-made fabrics, but I don't like using them now, I much prefer natural fibres. The worst part? I have several stashes. The clothing fabric stash, the quilting stash, the knitting stash and the spinning stash; all mostly natural fibres now though. What a great post. 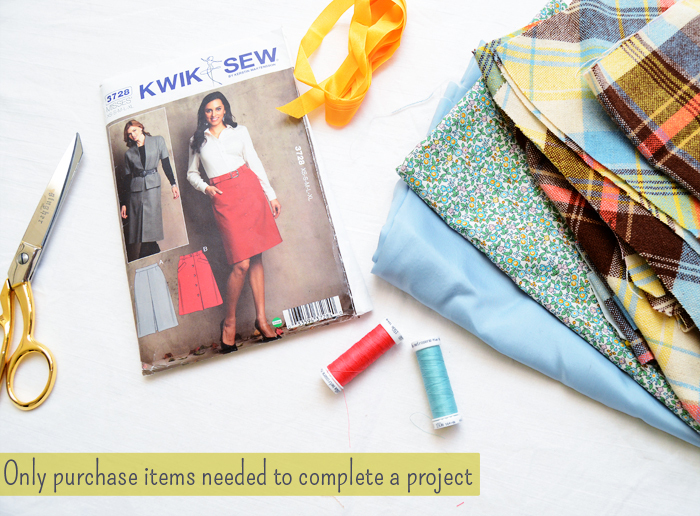 I always shop with a specific pattern in mind, but I gave so many projects backed up that I have a fabric stash which doesn't end up being the garment for which it was originally purchased. How I prioritise my projects has everything to do with what I need now! Well said Sunni. As i'm on a bit of a budget at the moment I tend to only by what I need...but that doesn't mean i don't spend an inordinate amount of time browsing, adding things to my basket & then having a rush of guilt & not actually purchasing! I have a very limited budget, as I am retired, and only buy fabric as needed for a specific project. What I have an issue with is all the leftover pieces I have AFTER cutting a garment out...I hate to throw it all away, but i have no idea what to do with it besides making a quilt or napkins. And much of the fabric isn't suited for those applications. I have started tweaking the pattern layout so as to save as much fabric as possible; oftentimes the layout suggested by the pattern company wastes alot of fabric without needing to do so. Then I can sometimes make a little tank top or baby item for my grandson. What do other people do ? Really excellent post. I have a problem of buying vintage fabrics in charity shops and on ebay, which is a dangerous thing to do. I do impose a rule about buying quite large pieces, 3 or more yards if possible. I have been known to buy vintage cotton curtains as well as I just love old or unusual prints. When I buy them I definitely have a good idea of what i am gong to do with them but then I get them home and I somehow forget! I like the idea of a notebook to help with planning, I will be using that one. I do tend to justify this hoarding because I think if I don't use it soon or lose interest I can always sell it again, and it's certainly a fraction of prices for new fabric to buy vintage. I will be curtailing my habit now though, I certainly have enough to be going on with. I didn't reply the first time I read this post, but using the fabric I have is probably the hardest thing about sewing for me. Especially the fabric I know I will never be able to find again, special older pieces that my grandmother gave me, or small expensive pieces that I am terrified to ruin. It is something that I need to work on and I am glad to know that I am not the only one. I love my stash with absolutely no guilt - I like pretty things but I do only try to buy beautiful fabric I will sew with someday. I think there is nothing wrong with having a good sized stash, it's fun to "shop the stash", it's inspirational and makes me happy. However I do agree that fabric is happier when sewn into an item you can wear rather than just endlessly petted. When you pair the perfect fabric with the perfect pattern it is bliss. My mum always "saves for best" , you know, the good china, the expensive perfume, but I think these things should be used and enjoyed or you'll never really enjoy them, same for your fabric. You are spot on! I have 2 yards of the most incredible chocolate plaid, a super comfy soft poly/wool with a gold thread that is going to make the most gorgeous skirt I've ever owned...or so that's the plan. I'm terrified to cut it! This stuff was nearly $25 a yard (but I got it on sale for $17.50) and there it sits. I'm a federal employee that has been furloughed and my unit makes us take Fridays off. So I've created "Finish It Up Furlough Friday!" On Fridays, I only tackle projects that are UFOs (unfinished objects) in my sewing zone. Designating a day for UFOs has really helped to clear out the clutter and uncomplicated my life. Good tips. I really like point 1. Even in the end, if a project is ruined, you can always use that special fabric as trim for another project, or to make an accessory. Beautiful fabric is wonderful to own, but it's even better to wear! Like Michelle I have acquired a fabric and pattern stash - more than I can use in a lifetime. I need to go on a fabric diet, but I enjoy it. While a piece of fabric remains flat and folded it possesses endless potential - same for the uncut pattern. Sooo true! I have boxes upon boxes of fabric that I've loved but have been afraid of ruining because I'm just too new to sewing. But like you, I find that I've learned something new about sewing just from challenging myself to face that fear (and sew that fabric). I've even found ways to use it unexpectedly. I had a decade-old gorgeous linen used to recover a slipper chair. And now rather than wear it seasonally as a fabric, I'll be seeing it and sitting on every day. Thank you for this post - it's nice to know I'm not the only on-the-verge hoarder! Thank you for this post! It definitely made me think about my hoarding habits. I always think I'm too much of a novice to use the good fabric even though I know the only way I'll ever get better at sewing is to work through my stash instead of just adding to it. Thanks again for the thoughtful post.